The Acstar Health Insurance company review is a review of the Acstar Insurance Company. It provides insurance in all 50 states and is headquartered in Connecticut. Our free online tool helps you find the best health insurance rates in your area. Enter your zip code to begin your search now! The Chairman, CEO, and President of the Acstar Insurance Company is Henry W. Nozko, Jr. Their Senior Vice President and CFO is Michael P. Cifone. For a list of other officer’s you can visit the Acstar website. The Acstar Insurance Company prides itself on creating a team atmosphere among its employees that fosters an entrepreneurial environment that is both challenging and rewarding. Those employed by the company enjoy an extensive benefits package that includes medical insurance, dental and preventative care insurance, life insurance, long-term disability insurance, vacation time, sick time, and even a 401K plan. The Acstar Insurance Company provides surety bonds for contract and commercial needs in standard and specialty industries in all fifty states. For the contract industry, they offer bonds for general building, highway, utility, and heavy and industrial contacting. For specialty contract bonding, the company provides bonds for design build, specialty industries, supply contracts, completion, service contracts, joint ventures, environmental remediation, advance payment, reclamation, and closure bonds. They also issue products for the more commercial industry. Some of these products include workers compensation insurance, financial guarantee bonds, miscellaneous bonds, licenses, permits, court bonds, and tax bonds. What are the types of surety business that the Acstar Insurance Company writes? They write most types of surety bonds. The company began writing them mainly for pollution, remediation contracts, and environmental contracts, but has since moved on to most other surety bond types. What types of information should a company submit to Acstar to establish a bond? There are many forms a company must submit to establish a bond program. Most of them are available on the Acstar Insurance Company website. The most common forms needed are a contractor’s surety survey, miscellaneous surety survey, a bond request form, an end of the year financial statement, a current interim financial statement, a personal financial statement for each owner of the company, a required bond form, and all other information listed on the contractor’s surety survey’s last page. Can the Acstar Insurance Company write federal bonds? Yes. The company has a Certificate of Authority issued by the United States Treasury Department. This qualifies them as an acceptable surety for federal surety bonds. How does a company start conducting business with the Acstar Insurance Company? To start doing business with the Acstar Insurance Company, a company has to fill out an agency agreement and a producer’s application to be included with its first submission. These documents should be mailed to the Acstar’s main headquarters. The address is 233 Main Street, New Britain, CT 06050. The documents can also be faxed to 860-229-1111. 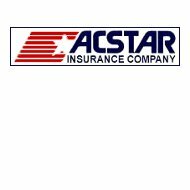 What are Acstar Insurance Company rates? Acstar uses around 20 different ratings factors to determine the premium rate of the bond in question. The Acstar Insurance Company does not offer any type of health insurance products, but there are plenty of companies where you live that do. Enter your zip code above to find the best health insurance rates today!